My life is substantially different than it was a year ago, when I moved to downtown Chicago to take a class in comic book writing. Since then, I’ve graduated, found myself a “grown-up” job, moved to a new city, and written a young adult novel. But the knowledge I learned and the experiences I gained from the best college class I’ve ever taken, stuck with me. I got lucky and somehow finagled my way into a comic book writing class at a college I wasn’t even attending, with a professor who was a real expert in the industry, and with a group of student who actually gave a damn about the oft misunderstood world of comic creating. I’d hate to be greedy. Not everyone gets to take a comic book writing class. So, while this series is long overdue (I promised it’d begin nearly five months ago), I’d like to present, Ms.Comix’ “I Can Write a Comic Book & So Can You,” a series of articles intended to take readers through the entire comic creating process from the perspective of a writer—a writer, mind you, who only “got into” comics two years ago, is a woman, is a feminist, was recently a student but now works (more than) full time in a real person job, and is, perhaps most importantly, incapable of drawing her own art. 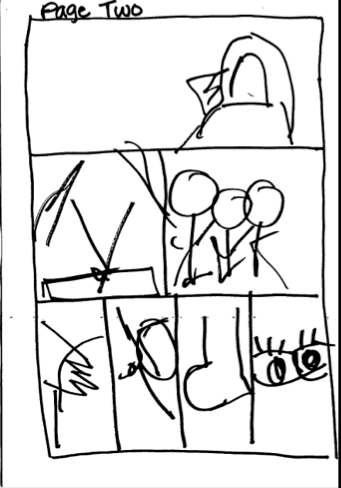 Storyboard. Trust me, it makes sense to me. I intend to walk through the entire comic-creating process from a writer’s perspective. Besides the actual script writing, I’ll address research, story-boarding, outlining, building a writer’s platform, working with (and finding) artists, seeking publication, and finding your place in the comic community. So come back. Subscribe to Ms.Comix emails. Walk with me through the highly-rewarding journey of a comic writer.